"Janet Armstrong Dodge, Westbrook College, Class of 1977"
Westbrook College student Janet Armstrong Dodge, Class of 1977, was a Fashion Merchandising major and lived in Ginn Hall. 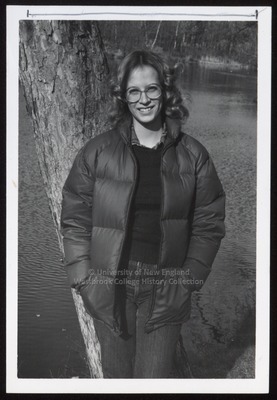 For her senior class candid photo, which appeared in the 1977 Tower Yearbook, she wore jeans, a dark crew neck sweater and a dark, quilted puffy jacket. Her hair was parted in the middle and long curls brushed her shoulders. Janet's glasses frames were dark, large and round. With hands in her jacket pockets, Janet leans against a tree trunk on the edge of the Evergreen Cemetery duck pond.